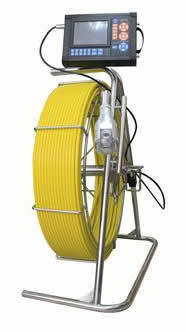 The TurboJet SuperMax negative air machine is a compact workhorse for commercial duct cleaning. 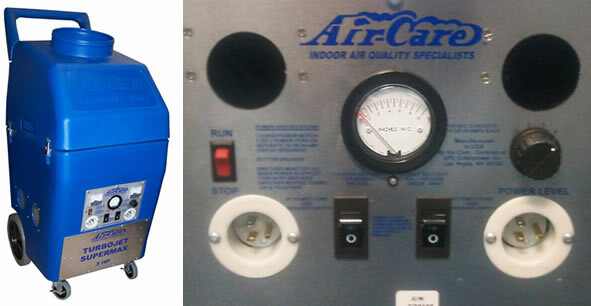 It's hard to believe a 22.5" wide cabinet can provide 3500 CFM and over 6" static pressure, a full-size 12" inlet, 3-stage HEPA filtration, soft start and will run at 13 or 18 amps on a single circuit at 1.5 horsepower or two separate circuits at 3 horsepower. This is performance that is found in units twice its size and weight. The legendary performance and size of this type of machine has been proven aboard ships and off-shore drilling rigs. The TurboJet SuperMax has a state of the art ESP speed control not found on any other TurboJets, until now. Portable at 151 lbs and only 22.5"w x 31.5"d x 55"h.
One-person operation, in and out of service vehicle and up and down stairs. 4 speed soft start 3.0 HP motor w/ 3 phase inverter and direct drive backward incline blower assembly. Filtration includes 1st stage 18" x 24" x 2" disposable pleated filter, 2nd stage 18" x 24" flexible permanent electrostatic air filter and 3rd stage 18" x 24" x 6" certified HEPA filter, providing efficient filtration with maximum air flow. 12 inch diameter inlet pulls over 5 inches of w.c. static pressure, and 3,500 CFM air flow. 12" rear, non-marking dolly wheels, 4" swivel non-marking casters up front. 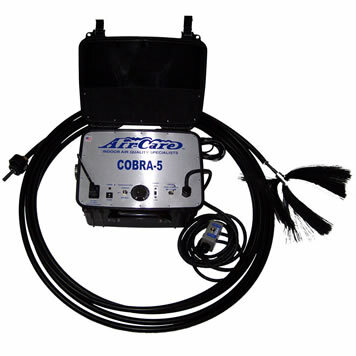 The Cobra 5 has a wired, handheld remote. It has Forward, Stop, and Reverse functions. The control panel has a continuously variable speed motor dial that allows you to go from 0-1750 RPM. The motor has plenty of torque to run the standard 3/8" steel cored cable for most ducts, but also has a "Low Torque" setting for use with the Dryer Duct Cable and 4" diameter brush or the Nest Claw. Representing perhaps the best value for money service is the PT Inspection Camera. Putting an end to speculation over the need to clean, the camera accurately records vision within ducts and pipes and is particularly useful for the inspection of risers. Not only able to detect unacceptable build-up the camera can be used to detect mechanical problems also. Super bright wide TFT monitor provides brilliant picture quality. Connection cable 60 to 80 metres. Waterproof high resolution 360° pan and 180° tilt camera head gives an inside view into air ducts. State-of-the-art battery packs provide 6 hours continuous operation. Crystal clear pictures and video provide you a detailed story as to the condition of your ducts.